One thing before we get cracking, I said in my first post that I would probably do a review on Captain America: Civil War. That’s probably not happening now. It’s a couple of weeks in to its run, everyone is already talking about it, and I don’t really have anything to add to the conversation. It’s a fantastic film. It’s my personal favorite super hero movie now. What everyone is saying is true. If you’re reading this, then you probably have already seen it. If for some reason you haven’t, then go see it. You won’t be disappointed. But now we go on to the main event. I’ve been thinking about these two stories a lot recently. Standoff concluded a few weeks ago, and The Darkseid War should be done by now but has been delayed numerous times. Both of these stories seem to be the buildup crossovers to each company’s next main event: Marvel’s Civil War II and DC’s Rebirth. The two events were spearheaded by writers that I really like, with Nick Spencer on Standoff and Geoff Johns on Darkseid. Both had me hooked in the beginning, but each ended up losing me before the end. However, they both went wrong in opposite ways. In short, Geoff Johns’ Justice League: The Darkseid War did too much with its plot, and Nick Spencer’s Standoff: Assault on Pleasant Hill didn’t go far enough with its plot. Let’s start with The Darkseid War, as this one is a more straightforward discussion. The story has gone on too long in terms of quantity of issues and passage of real-world time. It’s really as simple as that. When a story like this has this many delays, you can really feel it. It feels like I’ve been reading this story for a full year, and, since these comics come out monthly, that estimation isn’t that far off. 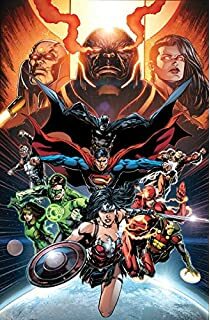 The prologue to Darkseid War came out last June 2015. It’s mid-May 2016 as I’m writing this. Every issue just seems to be layering more and more plot to make it resemble Crisis on Infinite Earths more and more. When a story tries to compare itself to an absolute comic masterpiece like that, it’s going to come up short more often than not. To add to it, the characters are coming off pretty boring. Grail and Fury are really not interesting, no matter how much backstory they are given. It was great seeing Darkseid again, but he was promptly killed. Lately, Superman, Batman, and Wonder Woman have resembled archetypes more than characters in this Justice League title. Flash, Shazam, Hal Jordan, Power Ring, Cyborg, and Lex Luthor are definitely more readable, but their time on-panel is not nearly spacious enough. The early twist of turning some of the League members into gods was naked in its attempts to pad out the plot and push the spin-off one-shots (even if some of them were quite good). When the Crime Syndicate showed up, my heart sank, as it signaled that this story was nowhere close to ending. I did like that Johns gave Moebius, the Anti-Monitor more depth in this story. However, he has been given a small share of space on the page. To make it worse (spoiler for those who haven’t read Justice League #49), Moebius was killed in the most recent issue. The deaths of him as well as Darkseid are sure to be temporary, which definitely takes away any tension from that aspect of the story. Also, the shaded-out sequence of Superwoman giving birth in #49 was… weird and (obviously) strayed pretty far from anything resembling realism, metahuman or not. Moving onto Standoff, the premise of this story excited me greatly. For the uninitiated, Pleasant Hill was a prison designed by Maria Hill to house many of Earth’s worst superhuman criminals. She used the sentient manifestation of a Cosmic Cube named “Kobik” (who has taken the form of a young girl) to mentally and physically transform these criminals into peaceful, happy members of this Leave it to Beaver-esque town. This Twilight Zone-like story premise is the kind of thing I love about comics. The social and moral implications of this setup are endless. To add to my excitement, the story focused a lot on the Winter Soldier, Rick Jones made a reappearance, and the headlining villain was none other than Baron Helmut Zemo, one of my all-time favorite Marvel rogues. All of this, and what does the story come down to? The All-New, All-Different Avengers, the Uncanny Avengers, Bucky Barnes, and the new Quasar squaring off against a bunch of bad guys. That’s fine by me usually, but the premise called for something so much more morally complex than that. Sure, the inhabitants of Pleasant Hill are murderers and thieves. However, what Maria Hill and Shield did to them by stripping away their very personhood and identities (giving them what one might call an Identity Crisis) could be considered a greater sin. At the very least, she is playing with forces far beyond her comprehension by using Kobik like this. The story seemed to be aware of this in the Alpha issue, with Steve Rogers challenging Maria Hill, the Winter Soldier sabotaging Shield installations, and the book focusing in part on the brainwashed Baron Zemo. The complexity seemed to disappear pretty quickly, though. I will say that the 75th Anniversary issue of Captain America was everything it needed to be. There were also some peculiar tonal issues in the second Captain America: Sam Wilson tie-in. Baron Zemo is usually an old-style, cold, and calculating villain. However, here he is depicted as a snarky, sarcastic, and less-than-intelligent leader who is not taking the scenario remotely seriously. Also, I will let the following page from Captain America: Sam Wilson #8, speak for itself. 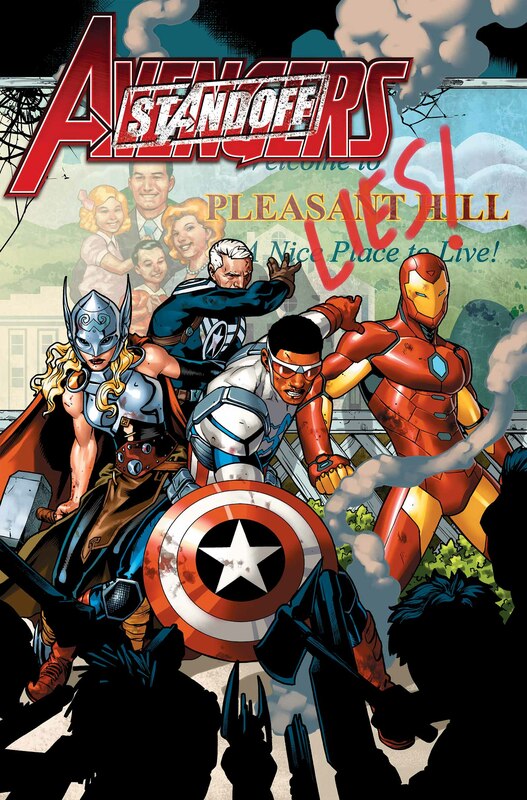 The icing on the cake was the Omega issue of Standoff, where the top level Avengers agree to simply sweep the whole ordeal under the rug to protect Shield and Maria Hill. This felt so out of character for all of the Avengers, especially Steve Rogers, Iron Man, and Sam Wilson, all of which were shown on the panel when this agreement was made. These heroes have not had qualms with challenging Shield when they felt it necessary (Civil War notwithstanding for Iron Man). This made the ending too clean, too neat, and far too simple. I can’t say that I took no joy from reading Standoff or Darkseid War. Each had cool moments. The Shazam, Flash, and Luthor Darkseid War one-shots were pretty solid. 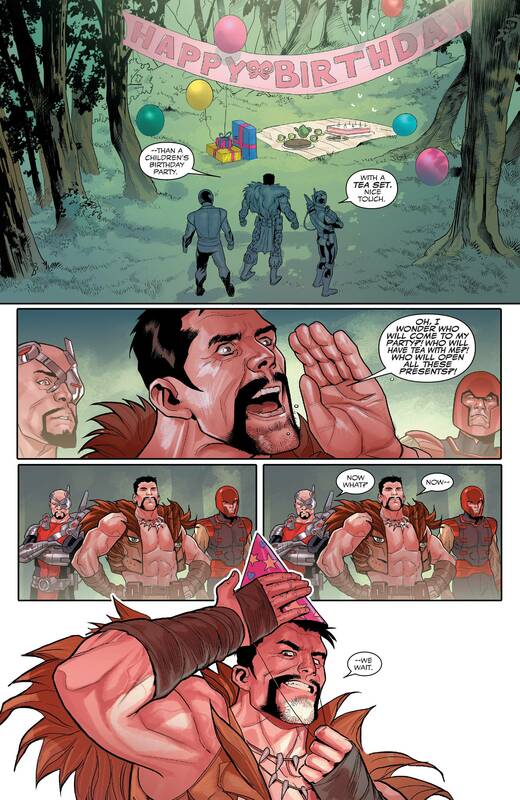 I loved the Standoff story from Al Ewing’s current New Avengers title more than the story itself. The final issue of The Darkseid War comes out later this month. Maybe the story will at least finish strong. When its released, you can bet I’ll have a review ready for your viewing pleasure. I know it didn’t take me long to start editorializing, but I have a lot of ideas I want to talk about that don’t really fall under the category of a straightforward review. I will have more reviews coming out in the next couple of days.